A growing number of medical schools are incorporating palliative care and end-of-life discussions into the curriculum. The result? Less suffering for patients and physicians. During her first rotation in internal medicine, Dawn Gross, MD, PhD, assessed a bone marrow transplant patient along with a group of fellow residents and her attending physician. When they left the young patient’s room, the attending said, “He’s going to die.” Two days later the patient was dead. “I remember thinking, ‘What did he see that I didn’t see?’” says Gross, who is now an associate professor in the department of palliative medicine at the University of California, San Francisco. Over time, she learned the science of illness and death and how to tell when a patient is dying. But what stuck with her was the fact that the patient had no idea he was going to die. Traditionally, a doctor’s primary job was to keep you alive, not discuss how you want to die — or even if you are going to. Now, the paradigm is shifting. Instead of employing extreme measures, doctors are increasingly learning how to stop interrupting death — and to talk about what that looks like. Unfortunately, data suggest most doctors feel ill-equipped to tackle end-of-life conversations. 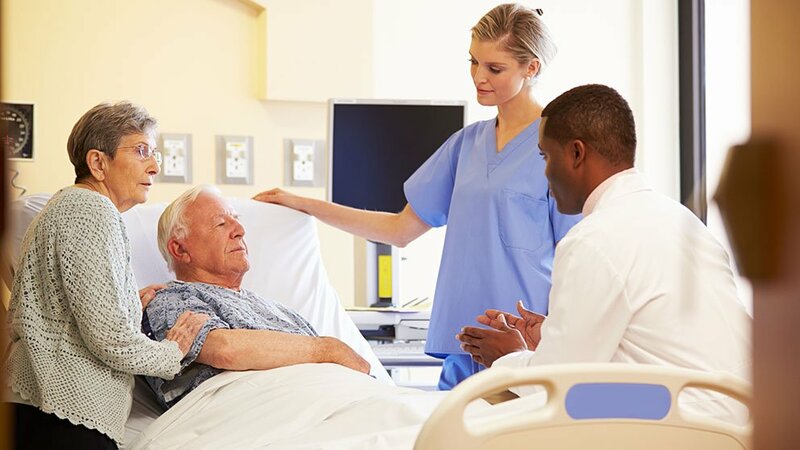 A 2014 study published in Palliative Supportive Care reported that more than half of respondents deferred conversations about advance directives to emergency room physicians. And in 2016, 88% of residents reported little to no training on end-of-life care during residency. But that is starting to change. Increasingly, medical school leaders are implementing end-of-life training that includes real-life practical skills. At the same time, more physicians are beginning to view end-of-life conversations as a medical tool that’s as important as any drug or device. The result: “Don’t die on my watch” is being turned upside down. With advances in medicine and technology, Americans are living longer, often with ongoing or repeated hospitalizations. More than one quarter of all Medicare expenditures occur during a patient’s last year of life. But life-extending treatments have trade-offs. If faced with a serious illness, most people say they would prefer a natural death rather than exhausting all medical options, according to survey data. And more than two-thirds of people say they want to die at home, while less than a third actually do. Medical schools are uniquely positioned to help bridge the gap between what patients want at the end of life and what they’re actually getting. Instead, many doctors focus on presenting a smorgasbord of medical choices — “then we let the patient choose so we feel like we’re off the hook,” says Daniela Lamas, MD, a critical care doctor at Brigham and Women’s Hospital, Harvard faculty member, and author of You Can Stop Humming Now. Yet, according to Scott Halpern, MD, PhD, MBE, professor of medicine at the Perelman School of Medicine at the University of Pennsylvania, the single most important determinant of the choices patients make is how doctors communicate. In a series of studies, Halpern and his colleagues discovered that seriously ill patients are more likely to select comfort-oriented care at the end of their lives if that was the default option they were randomly assigned. Similarly, when chest compressions, breathing machines, and feeding tubes were the default choices, they were more likely to select those invasive measures, too. The goal for physicians then is to know their patients well enough to shepherd them toward the treatment path that best matches their values. “It is scary to ‘nudge’ a patient toward an end-of-life decision, but maybe that’s what it means to be a doctor — leading patients toward the decisions that are most consistent with their wishes,” says Lamas. That’s one reason insurers are paying doctors to have real conversations around end-of-life planning. The goal: to limit suffering for the patient and his or her loved ones — but also to provide a meaningful way for physicians to help guide patients through the natural process of dying. Tell me more. Even if you’re only asking a family member to tell you more about their loved one, this simple phrase acts as a vehicle to learn more about what your patient values. “Taking a break from necessary medical talk and saying, ‘Tell me more about your husband’ can dispel tension and can turn around a difficult conversation,” says Daniela Lamas, MD, critical care doctor at Brigham and Women’s Hospital. “I wish.” “I wish” statements allow you to align yourself with your patient while remaining grounded in the reality of the situation. Gross uses an innovative card game called “Go Wish.” Developed by the Coda Alliance, a community-based nonprofit that promotes end-of-life conversations, the simple deck of 36 cards includes phrases ranging from “to have my family with me” to “not being short of breath.” “You ask the person to sort the cards according to what matters most to them,” says Gross. To that end, a growing number of medical educators are creating rotations within hospices, nursing homes, and assisted living facilities to give students and residents an opportunity to practice these skills. Institutions, including Tufts University School of Medicine, the Robert Larner, M.D., College of Medicine at The University of Vermont, University of California, San Francisco, School of Medicine, and others are weaving palliative care training into everything students do. “That’s a huge culture shift,” says Gross. To determine how best to train students to do this important work, Tufts University School of Medicine Dean Harris Berman has been meeting with the academic deans of four Massachusetts medical schools every six months since early 2017. The deans agreed upon a set of minimal competencies every medical student should have prior to graduation, and continue to work on next steps to meet and test these competencies. As part of this effort, Tufts University School of Medicine plans to introduce a new curriculum in the fall of 2019. “Rather than a single class, a ‘Patient Experience’ thread — encompassing end-of-life and palliative care, advanced communication, and impact of health on patients and their families — will follow students through all four years of medical school,” says Vesel. The Larner College of Medicine, too, is equipping physicians-in-training to have these conversations. In addition to integrating palliative care and end-of-life training into all four years of medical school, third year students participate in a “bridge week” focused solely on hospice and palliative medicine. The 35-hour curriculum covers practical skills, symptom management, communication tools (with hands-on simulated training), and resilience, explains Stephen Berns, MD, director of education for palliative medicine and assistant professor of family. Using tools developed by a nonprofit training organization called VitalTalk and Atul Gawande’s Ariadne Labs’ Serious Illness Care Program, Larner COM students learn how to share information, respond empathically, and drill down patients’ values. “It’s really about helping medical students and residents use their medical expertise to identify a treatment plan that matches patients’ goals,” says Berns. Surveys consistently show that care providers who do this well can make a significant difference for patients. Research indicates that palliative medicine can reduce anxiety and pain, relieve symptoms, and improve quality of life and mood. It can also reduce spending, according to a recent meta-analysis of inpatient specialty palliative care. At the dawn of medicine, physicians were with their patients throughout the life cycle — and certainly at their death. Doctors viewed being at the patient’s deathbed as an honor, a privilege. Medicine is slowly returning to those values. Research consistently shows that doctors who are comfortable with end-of-life issues provide better care to dying patients than those who aren’t. “More and more clinicians are recognizing their professional and moral responsibilities extend beyond preserving life and include helping people whose life is coming to an end have their last days weeks and months be as comfortable and fulfilling and meaningful as possible,” says Halpern.